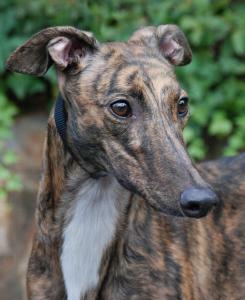 Hope is a tiny little girl with the prettiest dark, red brindle coat. Her birthday is April 20th 2006. She is just a bit shy and unsure of herself at first mainly just around men but warms up fast. Hope never raced because she would not chase the lure and would just stop in the middle of the track during training. She tested cat and small dog safe and was even a bit afraid of the cats so would be fine living with either. Hope has been in an adoptive home since she was just 18 months old. When Hope's owner had to go into a nursing home, one of her caregivers took Hope temporarily but eventually we had to find her a permanent home. She lived with another older female greyhound in her previous home and seems to get along well with others. Hope is already home acclimated and is a sweet, well behaved girl. She crates well and likes to go there during thunderstorms which scare her. Some of the photos of Hope were taken when she was 18 months old when she first retired from the track but she looks nearly the same now. There are a couple of recent full length photos of her under her other photos - the one of her stretching and the photo of her with the lab. This is a cute sweet girl that is already house trained and used to living in a home. She grins when she is happy to see you and will lay at your feet and make little moaning noises to get your attention - mainly if no one is petting her. She is such a cute girl with the sweetest personality!